The Croatia international has been with the Blaugrana for the past four-and-a-half seasons where he has commanded a regular role from the starting lineup. However, his future has come under question with the expected summer arrival of Frenkie de Jong, and Mundo Deportivo claims that the La Liga giants could ended their association with the World Cup finalist. Still, the midfielder won't come on the cheap and the Blaugrana are only prepared to entertain offers of around £43m for the Croatian, who has made over 250 appearances for the club. 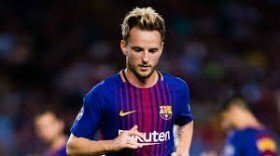 Aside from United, Rakitic has also been linked with the likes of Inter Milan and Paris Saint-Germain and the latter could yet pose the Red Devils' biggest challenge in luring the midfielder. Les Parisiens are alleged to have already sealed a pre-contract agreement for United's Ander Herrera but they are still said to be keen on strengthening the midfield further to better their Champions League title prospects next term.